A surprising number of jobs which execute on many clusters are single-threaded and non-parallel. In those cases parallelism is sometimes obtained as a by product of running many independent copies of the same program with a different choice of parameters. Consider the Monte-Carlo method for approximating Pi from the OctaPi project Calculating Pi. Like darts thrown at a dart board, this method generates random points in a square and then counts how many of those points fall into the circle. Note that due to the randomness, one obtains a different approximation of Pi with each run. While the dartboard method is a general way of approximating areas, it converges very slowly at a rate of 1/sqrt(n) and is, therefore, also one of the least efficient ways to compute Pi. The Python program included in the OctaPi project computes the percentage of darts falling inside the circle at a speed of 25000 darts/second using a precision of 100 decimal digits. To compute all 100 decimal digits accurately would require approximately 0.4E197 darts and consequently about 0.5E185 years to finish. On the other hand, the age of the universe is estimated to be about 1.3E10 years and it follows in that amount of time that a Pi Zero could throw 4.1E18 darts to obtain an approximation good to about 8 significant digits. As in the OctaPi project, our goal is not to compute Pi, but to understand parallel processing and how the Slurm batch system works. Since the original Python program was intended to be run interactively, it waits on user input for the size of each trial and the number of trials to run. In a batch system the program will be started when computing resources are available at some unspecified time in the future. Therefore, we specify the inputs for the program ahead of time. In the above case we set trial size to 100 and number of trials to 10000. We observe that 1000000 darts were thrown in about 40 seconds per Pi Zero for a speed of 25000 darts/second per Pi. Also note that the approximation is only good to about 3 significant digits even though 100 digits of precision were used in the calculation and that the resulting approximation is different for each run. In particular, averaging the approximations obtained by all the runs results in a better approximation. This is how we shall obtain parallel speed-up when using multiple Zeros. printf("Estimating Pi using Dartboard/Monte-Carlo Method\n"
printf("Trial %u using seed %u with %u inside"
printf("\nThe value of Pi is estimated to be %.15f\n"
printf("Total running time %g seconds\n"
with 1000 trials of 100000 points. using 1000 trials of 100000 points each. with average rate of 3.36379e+06 darts/second. We note that the C code runs about 132 times faster than the Python code. Therefore, if a Python program is running slow, it might be wise to translate it to a more efficient language before making a parallel version. On the other hand, the original Python code may run as fast as the C version using the PyPy just-in-time compiler. It would be interesting for someone to check this. In subsequent posts we obtain a parallel increase in speed for the C version of this computation using the OpenMPI message passing interface. Last edited by ejolson on Fri Oct 12, 2018 11:24 am, edited 1 time in total. In this post we will create a parallel Monte-Carlo approximation of Pi. Almost all parallel programs that run on supercomputers are created using the MPI message passing interface. This library passes messages over the high-speed interconnect to copy data back and forth between distributed memory to coordinate the individual nodes in order to perform a single computation. From an educational point of view, it is wonderful that the same MPI libraries used to program the fastest supercomputers in the world also run on the super-cheap Raspberry Pi cluster. To use MPI, a parallel code must be divided into ranks that run on separate CPUs. As all supercomputers run Linux these days, it is reasonable to think of a rank as a Linux process. To minimize latencies induced by context-switching in general purpose operating systems not designed for message passing, most MPI libraries busy wait and spend 100% CPU rapidly polling until new data arrives. Historically, busy waiting was not seen to be a problem because it was assumed that there is exactly one CPU reserved for each rank. It also significantly speeds things up when using shared memory to pass messages between ranks on a multi-core node. Unfortunately, busy waiting reduces energy efficiency by preventing modern hardware from entering low power states, it makes multi-threaded programming difficult and it degrades throughput in cases where the CPU could have been used for timeshared multitasking. In particular, busy waiting does not speed things up for the super-cheap cluster. There is significant latency already present in the USB Ethernet gadget and using shared memory by multi threading is not possible because there is only one CPU per Zero. Moreover, having only one CPU means nothing is left to run the operating system if we devote the entire CPU to the MPI calculation. Currently there are two competitive implementations of the MPI library. MPICH which was developed at Argonne National Laboratory and OpenMPI which represents a merger between versions developed at the University of Tennessee, Los Alamos National Laboratory and Indiana University. Between the two, it turns out that MPICH can more easily be tuned to use blocking input output instead of busy waiting. However, the version of MPICH included in Raspbian was configured to use busy waiting. Therefore, we configure and compile it ourselves. printf("Trial %u rank %d seed %u with %u inside"
with 10000 trials of 100000 points. using 10000 trials of 100000 points each. with average rate of 1.61357e+07 darts/second. and conclude that our cluster of five Zeros performs the Monte-Carlo calculation almost five times faster than a single Zero. Last edited by ejolson on Fri Oct 12, 2018 11:27 am, edited 2 times in total. with average rate of 1.64984e+07 darts/second. and infer the above program is slightly faster than the previous MPI code that used simulated remote procedure calls. Using MPI_Reduce works well for the Monte-Carlo simulation, because each trial takes the exact same amount of time because each node in the super-cheap cluster has the same performance characteristics. Thus, the total work needed to throw all the darts is easily partitioned between the individual ranks ahead of time. If the cluster were heterogeneous made out of computers running at different speeds or if some of the nodes were over provisioned running additional tasks, then it would not be possible to accurately partition the work ahead of time and the program would run only as fast as the slowest node. We emphasize that using simulated remote procedure calls as in the previous MPI code adapts to situations where the time to compute each trial on any particular node is unpredictable. At the same time, the number of ranks to which this method can scale is limited by the fact that the rank 0 process must explicitly start each trial on each of the other ranks. In the case of the super-cheap cluster, there are only 5 nodes so this is not an issue. However, larger clusters have thousands of nodes. In that case MPI_Reduce may be preferable because it uses sophisticated algorithms built into the MPI library that can scale to a much larger number of ranks. with 10000 trials of 1000000 points. using 10000 trials of 1000000 points each. with average rate of 6.35523e+08 darts/second. times faster than the super-cheap cluster. This is actually less of a speedup than I had expected, especially considering the Xeon server costs about 100 times more than the entire Pi cluster. Note that we are essentially testing the speed of the pseudo-random number generator built into the C library between the ARM and x86 versions of Linux. If five Xeon nodes were devoted to the computation, one would expect a 188 times performance increase. Additional speedup may be possible with tuning. We end this post with the following observation: It is significant from a learning point of view that the code developed for the super-cheap cluster will run on a real supercomputer without modification using exactly the same commands. This post describes how to install and run the linear algebra benchmark called HPL that solves systems of linear equations using Gaussian elimination with partial pivoting. This benchmark is used for ranking the top 500 supercomputers in the world in both performance and electrical efficiency. export SQUEUE_FORMAT="%.6i %.18j %.10u %.2t %.11M %.3C %.8r %N"
Be sure to watch out for kernel upgrades. If the kernel is upgraded you will have to regenerate the initramfs and copy the new kernel into the correct place manually for the new kernel to be used. At this point I discovered that the original 48M size of the /boot partition was too small for the package manager to update the kernel and initramfs while also storing the additional files mykernel.img and myinitrd.img. This oversight has been fixed by editing the earlier posts to specify a /boot partition size of 96M. Propagate the changes from the head node to the computational nodes by shutting them down, updating their snapshots and rebooting them using the same combination of sreboot, supdate and szeroup commands described earlier in this thread. #  notice, this list of conditions and the following disclaimer. #  documentation and/or other materials provided with the distribution. #  Tennessee, Knoxville, Innovative Computing Laboratory. #  OF THIS SOFTWARE, EVEN IF ADVISED OF THE POSSIBILITY OF SUCH DAMAGE. # -DAdd__             : the FORTRAN compiler in use is f2c. #    *) not display detailed timing information. 1            # of recursive panel fact. which indicates that the aggregate performance of the cluster is about 1.1 Gflops. This result is about 6 times slower than a single Raspberry Pi 3B but similar to the Terrible Cluster which reached a speed of 1.3 Gflops. I suspect the 20 percent improvement in speed for the Terrible Cluster may come from running part of the computation on the head node, which has faster communication to the other nodes. In 1993 the super-cheap cluster described in this thread would have ranked about 250 on the list of the top 500 supercomputers, right next to the Cray Y-MP. For further comparison, note that on the same benchmark the four cores in the Pi 2B achieve 1.56 Gflops, the Pi 3B achieves 6.4 Gflops and the Pi 3B+ achieves 6.7 Gflops. Moreover using a larger 20000 by 20000 matrix, an AMD Ryzen 1700 8-core 16-thread desktop achieves 89.9 Gflops, a dual Intel E5-2620 Xeon 12-core 24-thread server achieves 226.0 Gflops and a dual Intel Gold 6126 Xeon 24-core 48-thread server achieves 344.3 Gflops. As of November 2017, most of the computational power represented by the supercomputers in the top 500 list is delivered by NVIDIA GPU and Intel Phi multi-core accelerators. A notable exception is the fastest machine on the list, the Sunway TaihuLight, which uses a custom processor designed and manufactured in China supplemented by no additional accelerators. In the case of the super-cheap cluster, the CPU in each Pi Zero includes a VideoCore IV GPU with a peak speed of 24 single-precision Gflops. In total, therefore, our super-cheap cluster has a theoretical peak of 120 single-precision Gflops. However, since the Linpack benchmark dictates the use of double precision, it is difficult to use the VideoCore IV in the Pi Zero to speed things up. Before abandoning the idea of using the VideoCore entirely, note that it is possible to emulate double precision by using two single precision numbers. This float-float representation is described by G. D. Gracca and D. Defour and by A. Thall. We note that the correctly rounded float-float sum df64_add is obtained using 20 single precision operations while the float-float product df64_mult takes 22. Dividing 120 by 21 suggests that the 5 node Pi Zero cluster has a peak rate of about 5.7 float-float Gflops. While it is reasonable to assume peak rates will not be achieved, it would be interesting if someone wrote a float-float linear algebra solver using QPUlib to test whether increased performance is possible. I suspect the resulting speedup would be somewhere between 1.3 and 2.7 times; however, the computation might run slower instead. Last edited by ejolson on Wed Sep 05, 2018 7:41 pm, edited 2 times in total. So far we have written two parallel MPI programs that implement the dartboard method for computing Pi. One version used MPI_Recv and MPI_Send to emulate remote procedure calls in order to be as close to the original Python program as possible while the other version was simpler and used MPI_Reduce. Recall that using MPI_Reduce for computing Pi resulted in a more efficient computation. Using MPI_Reduce works well for a Monte-Carlo simulation because the total work needed to throw all the darts is predictable and easily partitioned between the individual ranks ahead of time. There are also parallel computations for which it is not so easy to predict how much work any single part might take. Emulated remote procedure calls automatically adapt to situations where it is not possible to evenly partition the work between the nodes ahead of time. Remote procedure calls can also overcome difficulties when the cluster is heterogeneous and some computers run more slowly than others. Total running time 182.86 seconds. Total running time 38.6461 seconds. Finished rank 3 slice in 23.9256 seconds. Finished rank 4 slice in 24.3671 seconds. Finished rank 2 slice in 31.8431 seconds. Finished rank 1 slice in 45.6 seconds. Finished rank 0 slice in 55.7153 seconds. Total running time 58.5545 seconds. 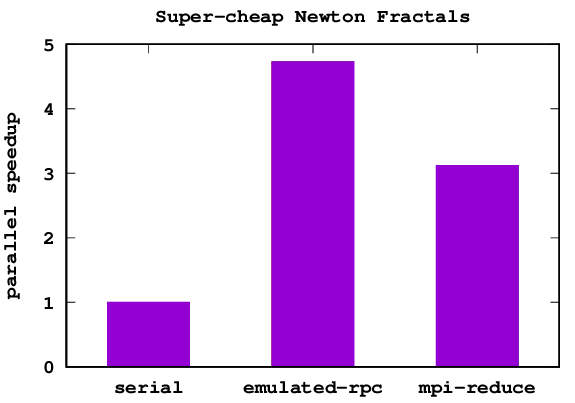 Note that newton_mpi.c achieves almost perfect parallel scaling to the 5 nodes in the super-cheap cluster while newton_reduce.c is significantly less efficient. Although MPI_Reduce performed better for the Monte-Carlo calculation of Pi, the situation is reversed in the case of Newton fractals. 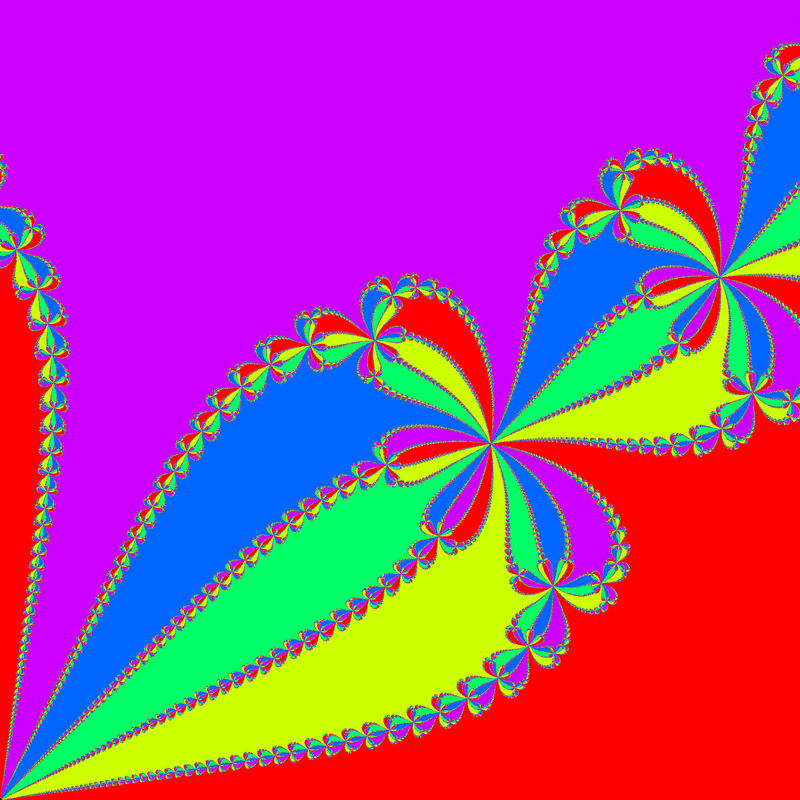 The work is hard to partition ahead of time because different parts of the Newton fractal take more or less time to compute based on the complex iterated dynamics. For reference, the code for newton.c, newton_mpi.c and newton_reduce.c are included below. "Compute Basin of Attraction for Newton's Method\n"
"Image size %d x %d with maximum of %d iterations\n"
In this post we explore the use of the super-cheap cluster for sorting. This time the goal is not parallel speedup, but to combine the distributed memory of multiple nodes to sort large datasets. Consider the task of sorting 200,000,000 four-byte integers. Since a dataset of that size takes 763MB of memory, it is not possible to store it in the 512MB RAM available on a single Pi Zero. While out-of-core sorting algorithms exist, they run much slower than the parallel algorithm described here. The algorithm we shall employ is called odd-even sorting. Suppose there are N nodes in the cluster. First partition the data among those N nodes. Each node then sorts its part of the data in parallel. Finally, data between nodes is merged between even and odd nodes. After N merge operations the lowest MPI rank has the first part of the sorted data, the highest rank has the last part, with the rest of the data being stored in order on the ranks in between. Since N merge operations must be performed using 1/N the size of the data, there is no expected parallel speedup from this algorithm. However, there is no expected slowdown either. Also note that merge operations require twice the amount of memory as needed to store the entire dataset. The super-cheap cluster consists of five computational nodes with 512MB each. Since some of that memory is used for operating system tasks and overhead, there is about 480MB per node which can be devoted to sorting. Multiplying that by five yields a total of 2400MB available distributed memory. This is more than enough to accommodate the 1526MB needed to merge our 763MB dataset. Perform serial sorting using qsort. Sorting total 100000000 integers in serial. Finished sorting in 155.168 seconds. Perform odd-even sorting using MPI. Sorting total 100000000 integers using 5 ranks. Rank 4 finished sorting in 150.809 seconds. Rank 2 finished sorting in 181.27 seconds. Rank 0 finished sorting in 181.525 seconds. Rank 3 finished sorting in 181.341 seconds. Rank 1 finished sorting in 181.755 seconds. The timings for only the sorting (neglecting file input and output) show that the parallel sort itself is about 20 percent slower than the serial code. However, after including file input and output the total wall time is almost exactly 5 minutes for either method. Since total wall time is what really matters to a person waiting for the program to finish, we conclude that the parallel and serial sorts take about the same amount of time. Finally, we demonstrate the use of distributed memory by sorting a larger dataset that doesn't fit in the memory of a single Pi Zero. Sorting total 200000000 integers using 5 ranks. Rank 4 finished sorting in 309.344 seconds. Rank 0 finished sorting in 378.947 seconds. Rank 2 finished sorting in 371.555 seconds. Rank 3 finished sorting in 371.941 seconds. Rank 1 finished sorting in 370.915 seconds. This is consistent with the expected nlogn asymptotic performance of a reasonable sorting algorithm. This code was modified by Eric Olson for the super-cheap cluster. Have you tried installing docker swarm on it. I have and it hangs when replicating images across the nodes. Have you looked at this blog and the links it contains? There it clearly indicates the possibility of running a Docker swarm on a cluster of USB networked Pi Zero computers. I suspect they are each running from local SD cards rather than mounting root from NFS as in this tutorial. If you are following this tutorial exactly, it is worth noting the individual compute nodes are completely isolated from the Internet. If your Docker configuration needs to contact an Internet-hosted server while running, you should further setup the host computer as a masquerade firewall. This should prevent the Zeros from hanging when they try to access the Internet. thanks for quick reply. Will look into the pointers you provided. Very informative article. Sorry to hear you are having trouble with your network of USB Ethernet gadgets. For the record, the super-cheap cluster described in this thread has no such problem. In particular ssh sessions are stable and I can run MPI applications which are fairly network intense. It should be noted that I'm still running a 4.9.59 kernel because of bugs in the 4.14.x series which affect the use of jumbo packets in the Ethernet gadgets. I would also point out that for the configuration described in this thread, the NFS server is backed by a BTRFS copy-on-write filesystem. While the ability to create snapshots is not exported through NFS, the resulting subvolumes are. Therefore, Docker containers could be efficiently created on the head node using the copy-on-write semantics and then executed on one of the attached Zero compute nodes. I find this to be a way to complex way of benchmarking. I know nothing about benchmarking so dont get me wrong. This aint for me, i just wanna kode and have the computitations spread over several computers. Sounds good. I reported how long it takes to execute each example program because it is rather easy to spread a computation over several machines and then have it take longer than using only one. Just like adding manpower to a late software project makes it later, adding processors to a lengthy calculation can also slow things down. This parallel processing analogue of Brooks' Law was amusingly expressed by Seymour Cray as "if you were plowing a field, which would you rather use: two strong oxen or 1024 chickens?" The new Summit super-computer at Oak Ridge National Laboratory uses 2,397,824 oxen and they are worse than the chickens. The difficulty of obtaining parallel speedup in practice when solving a problem using a cluster is why it is important to have real hardware to test your code on. The fact that anyone can purchase 1993 levels of super-computing performance for the price of a nice meal for two means almost anyone with an interest can begin understanding the constraints of synchronization latency and communication bandwidth that still affect parallel algorithms today. Developing practical code that works well on clusters, though difficult, is now possible without a hundred-million-dollar budget. If you don't want to include timing routines in your software as I have, you can either use the built-in time command to check how fast your program finished or a hand-held stopwatch. Having said this, many scientific codes as well as games have either built-in performance metrics or a set of regression tests to check what the current computational speeds are. This is useful, for example, when scheduling time on bigger clusters to solve problems sized to the limits of current technology. It will be interesting to see what kind of parallel programs you code for your cluster. I've been thinking about creating a version of the shared-memory parallel Fibonacci programs studied in this post (see also here and here) that uses a message-passing approach to run on a distributed-memory cluster. As indicated in those posts, the SMP program ran 4 times faster using 5 processors. It would be a significant achievement, in my opinion, to obtain even a three-fold performance increase when using the 5-node super-cheap cluster. I've been thinking about creating a version of the shared-memory parallel Fibonacci programs studied in this post (see also here and here) that uses a message-passing approach to run on a distributed-memory cluster. As indicated in those posts, the SMP program ran 4 times faster using 5 processors. It would be a significant achievement, in my opinion, to obtain even a three-fold performance increase when using the 5-node super-cheap cluster. There is now available here an MPI-parallel Fibonacci code that can run on the super-cheap cluster. The parallel speedup as measured by wall time did not quite reach 3, but was 2.718 instead. Since there are 5 nodes this translates to a parallel efficiency of 54 percent. As the total calculation time was around 9 seconds, the size of the problem may not be large enough to clearly offset the overhead of starting multiple communicating ranks across the cluster. I'm my opinion, it is likely that computing a larger Fibonacci number could achieve efficiencies as great as 80 percent. Great thread ejolson et al. Thanks.